Screening is a vital part of helping identify risk and detecting disease early. It is a way of finding out if people are at higher risk of a health problem, so that information can be given to help them make informed decisions about treatment options. 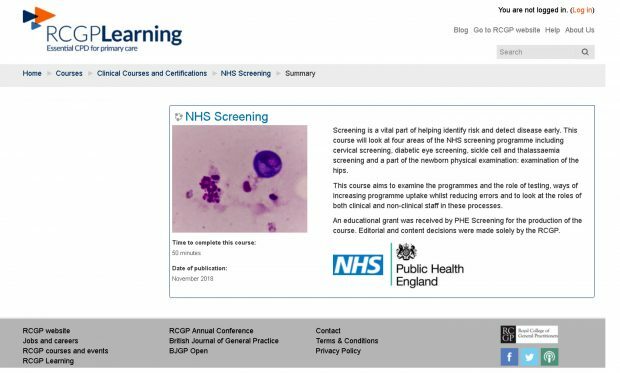 The Royal College of GPs (RCGP) has published new e-learning content, in conjunction with PHE Screening, that gives my GP and primary care colleagues practical guidance to support patients in understanding and accessing NHS screening programmes. The 3 punchy 15-minute modules and one 5-minute podcast cover cervical screening, diabetic eye screening, sickle cell and thalassaemia screening and one part of the newborn and infant physical examination: the examination of the hips. The e-learning is available to all healthcare professionals, including the RCGP’s 59,000 GP members. Not only is e-learning the most effective and efficient method of getting screening information across to primary care, it also contributes to GPs’ revalidation and continuing professional development (CPD). Cervical screening is a method of detecting abnormalities of the cervix before they become malignant. It aims to reduce the number of cases of cervical cancer as a result. It is not a diagnostic tool. The NHS Cervical Screening Programme aims to reduce the incidence of invasive cervical cancer and reduce mortality rates. PHE estimates that cervical screening in the UK saves up to 5,000 lives a year. how frequently should cervical screening occur? Diabetic retinopathy is one of the most common causes of sight loss in people of working age. The NHS Diabetic Eye Screening Programme aims to detect the condition before changes in vision occur. The NHS Sickle Cell and Thalassaemia (SCT) Screening Programme aims to support people to make informed choices during pregnancy and before conception. It also works to improve infant health through prompt identification of affected babies via newborn blood spot testing. The NHS Newborn and Infant Physical Examination (NIPE) Programme aims to identify and refer all children born with detectable congenital abnormalities within 72 hours of birth, and to further identify abnormalities that may become detectable by 6 to 8 weeks of age. The new RCGP 5-minute NIPE podcast focuses on the hip examination, including topics such as ‘clicky hips’. My fellow GPs and primary care colleagues can now also refer to the PHE Screening guidance for GPs and practice staff for more information on how to support patients in accessing screening and obtaining screening results. Thanks. Is this free to all GPs or only paid members of the RCGP? The resource is free until November for anyone in the UK that registers with an RCGP e-learning account. For non-UK residents, the cost is £55. Great, thanks for the prompt response and clarification. Hi, this is very helpful thanks. Are there any plans to extend this to breast, bowel and AAA screening? Thank you for getting in touch about the new RCGP screening e-resources for the AAA, DES, SCT and NIPE programmes. I am delighted you found them useful. We are now undertaking a 6-month 'measures of impact' project. Once this is completed the project outcomes will be presented to our senior management and they will be in a position to make an informed decision regarding the development of any further RCGP screening resources.